Most people who purchased games online or in store normally does not keep track of the serial number, registration code or CD key on DVD/CD case which used to install, activate or unlock the games, until when it’s about time to reformat or reinstall Windows. For people who misplaced, lost or forgotten the serial keys or registration information of the installed purchased PC games, Game Key Revealer can help to retrieve or recover the license information. 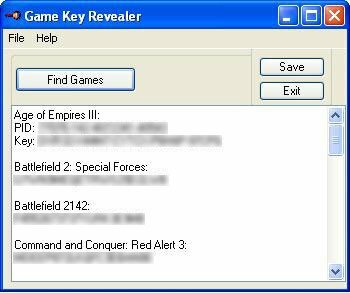 Game Key Revealer is a software utility that retrieves the CD-key and serials for installed games on computer. Essentially, Game Key Revealer is pretty much the same application with many software application which reveals, retrieves, or recovers application’s serial code or product key, such as Keyfinder Thing, Recover Keys and License Crawler, but its main focus is on games. Scan and display serial keys of more than 1000 games. Save to Text or Word (Word XP and above). No installation required and can be ran directly. Once user clicks on “Find Games” button, Game Key Revealer will scan and crawl the computer for all game keys or serials. Game Key Reveals supports almost all versions of Windows, including Windows 98, Windows ME, Windows XP, Windows Vista, Windows 7, Windows Server 2003, and Windows Server 2008.